Dancoal eco-firelighter is a highest quality, FSC certified product. It is manufactures from a compressed wood fibre, soaked with natural wax or high quality paraffin. It lights up very well and is safe in use. It does not emit odour. It starts charcoal or charcoal briquette quickly and burns itself completely. The increased ignition temperature protects against accidental lightning up of the firelighter. Place a couple firelighter cubes and ignite. Subsequently, add the charcoal, briquettes or wood in the proper amount, not to let flame die down. The BBQ is ready to use when the firelighter burns out completely and charcoal gets covered with a coating of ash. 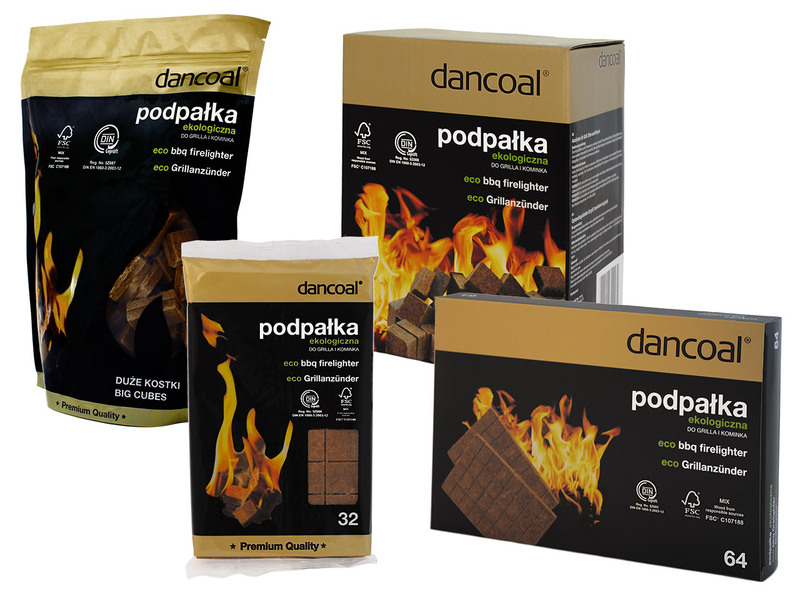 Dancoal eco-firelighter guarantees 100% satisfaction. Odourless, safe in use and environmentally friendly. Eco BBQ firelighter 32 pcs. Classic „tablet” scored into 32 cubes. Manufactured from compressed wood fibre, soaked with natural wax or high quality paraffin. Packed into an aesthetic plastic film. Odourless, safe in use and environmentally friendly. Eco BBQ firelighter 64 pcs. Economic package. Two scored firelighter tablets, put together into plastic film and packed into an elegant box. The cardboard box, covered with UV coating, effectively protects the firelighter from the negative influence of weather conditions. Odourless, safe in use and environmentally friendly. Big, economic package. The box holds 72 firelighter pieces. The cubes are already separated, which in combination with wide package makes firing up even more convenient (especially when done frequently). Odourless, safe in use and environmentally friendly. 72 bigger and thicker cubes, packed loose into a handy, modern, plastic bag. The package has a string reusable closure. Bigger firelighter pieces, meet the needs of the most demanding Customers. Odourless, safe in use and environmentally friendly.